Calendula is an amazing herb and flower. Beautiful, healing, useful, and edible. It's one of my favorite floral blooms in the garden and something I plant much of every year. If you've got some or are wanting some here are some tips to growing and using calendula. Seeds can be sown directly into the ground a couple weeks before the last frost or started indoors 6 to 8 weeks before the last frost. I always start my seeds in the greenhouse. They like full sun but will tolerate partial shade. I grow a few in pots on the porch but can say that the ones grown out in the garden with full sun do much better. Remember to keep track of your planting schedule and harvest with The Gardening Notebook. 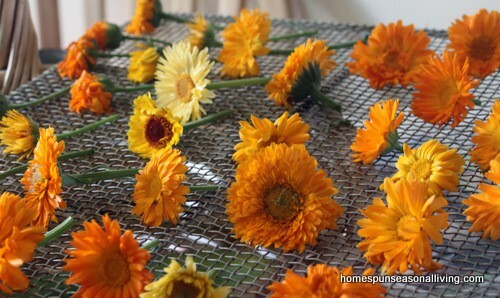 When harvesting calendula, it's the petals we're after. Cut blooms when they're open and supple – not at all wilted or starting to dry. 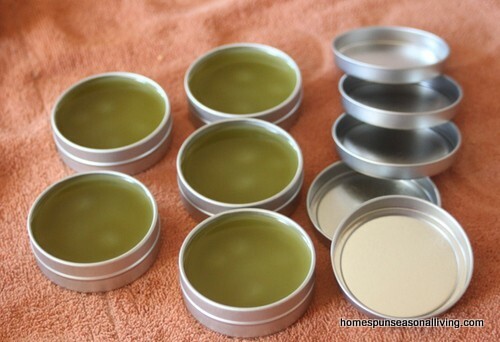 You can use the calendula fresh or dry it for future use. To dry, simply lay out on a shelf or tray until the leaves are crisp. Pull the petals off the plant and store them in a jar until ready to use. Allow the flowers to bloom and die back. The seed heads will form here. I leave them on the plant until quite brown then pull off and harvest all the ‘c' shaped seeds. Keep the seeds in a dry, cool place until ready to replant. Rosemary Gladstar mentions many applications of calendula in her books and includes it in several tonics for the lymphatic system and respiratory systems. In a talk I saw given by Paul Bergner, he recommended calendula and plantain tea to treat leaky gut. Calendula is often part of homemade healing salves and provides relief from burns, including sunburn. Calendula is considered to have many soothing and softening qualities making it a great addition to bath teas and homemade body products. These body products, like sugar scrubs, lotion bars, bath melts, and more are a great way to include a little homegrown goodness in gift baskets. Toss some petals into risotto to give it that saffron-yellow color. The flavor is different but no-less-delicious and much more frugal. 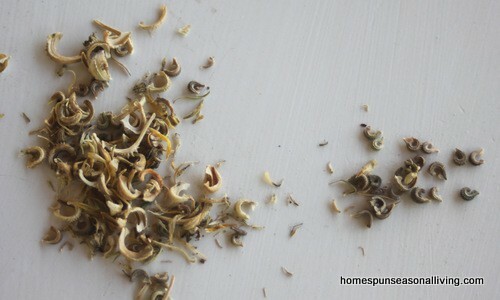 The fresh petals make a wonderful addition to salad and you can make cookies, soups, and more from the dried petals. Be adventurous here! How about you? How are you growing and using calendula in your garden and home? This is the second blog I have read this morning that is talking about Calendula. Thanks for the education and growing tips. These cheerful blooms my make an appearance in my flower gardens next year. Nice article! 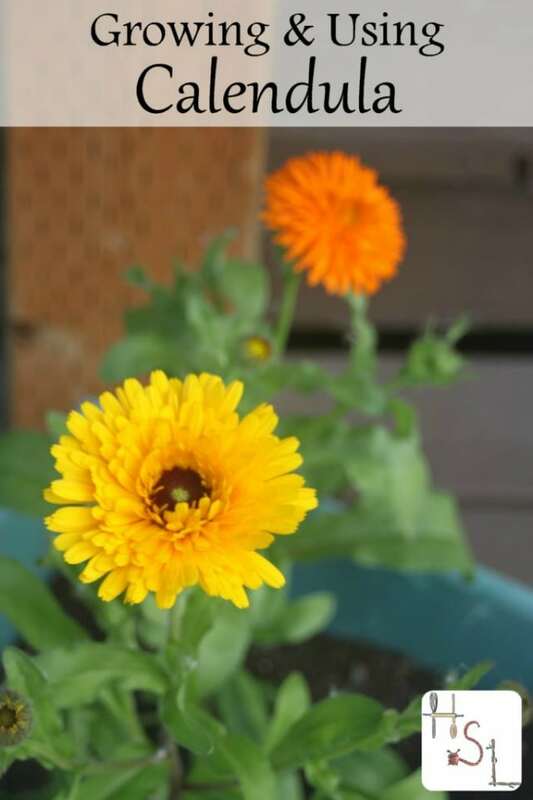 I just started growing calendula from seed this year and all of the flowers will be saved for seed for next year. I just happen to have purchased a large bag of dried flowers so I’m good for a while on those, but looking forward to growing a HUGE batch to harvest next year. Thanks for sharing. Excellent site! Thank you from Argentina! I grow calendulas every year. I’m fortunate that they do self sow for me. When I do plant seed, I always direct sow it into my garden. 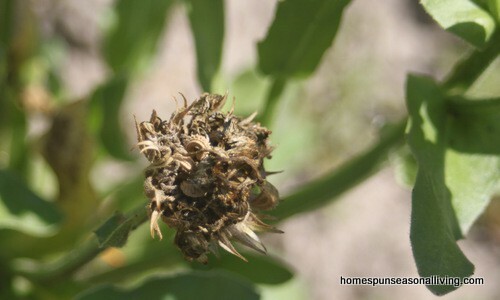 My experience is that calendula do not like to be transplanted. How wonderful that they self-sow for you! I start the seeds in my greenhouse every year and transplant outside with no problems. We’ve had calendula before, but I really haven’t used it for many things. I just moved into the “City of Marigolds” and wanted to both pay it homage and learn about herbal uses this year. FYI, the link to Paul’s article is no longer there. I hope you have so much fun learning to use these amazing flowers! Thanks for telling about the link, I removed it – bummer.